Lineage: Formed at Nowshera by Lieutenant C. H. Brownlow in 1857 from ”8 companies transferred from the 4th and 5th Punjab Infantry and designated the 8th Regiment of Punjab Infantry”. Its designation changed twice in 1861 first becoming the 24th Regiment of Bengal Native Infantry and then the 20th Regiment of Bengal Native Infantry. In 1864 it became the 20th (Punjab) Regiment of Bengal Native Infantry and in 1883 the 20th (Duke of Cambridge’s Own Punjab) Regiment of Bengal Native Infantry. Then the 20th (The Duke of Cambridge’s Own Punjab) Regiment of Bengal Infantry in 1885 and the 20th (The Duke of Cambridge’s Own) Punjab Infantry in 1901. In 1904 it became the 20th Duke of Cambridge’s Own Infantry (Brownlow’s Punjabis) and the 2nd Battalion, 14th Punjab Regiment in 1922. 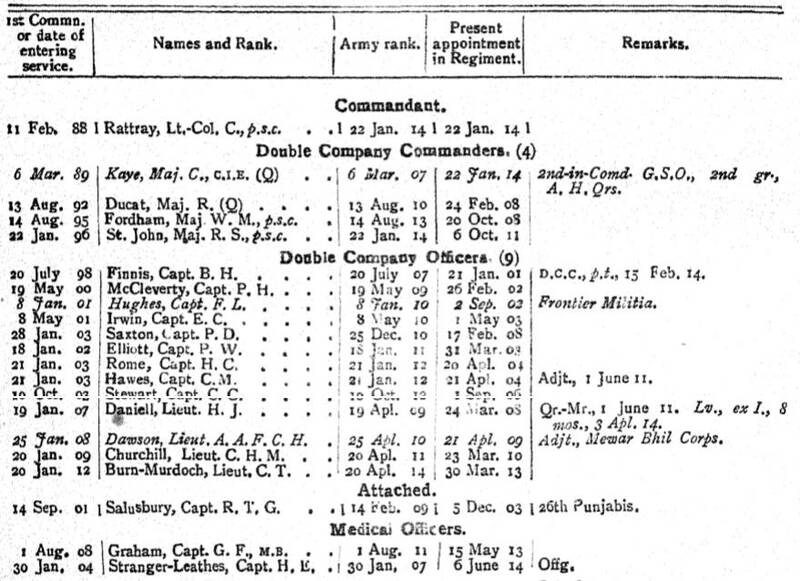 Class Composition of Battalion in 1914: 4 Companies of Pathans, 2 Companies of Sikhs and 2 Companies of Dogras. 1919: 2 Companies of Pathans, 1 Company of Sikhs and 1 Company of Dogras. Location in August 1914: The 20th Punjabis was stationed at Poona (Pune, Maharashtra, India) having arrived from Jhelum (Punjab, Pakistan) on 25th February 1914. The 20th Punjabis was stationed at Poona when the First World War began in August 1914 and served as part of the 16th (Poona) Brigade, 6th (Poona) Division. The Regiment landed in Mesopotamia (Iraq) in November 1914 and was initially part of the Anglo-Indian advance towards Basra. However, unrest in the Regiment’s Afridi Company led to desertions and the 20th Punjabis was withdrawn from the front line in early March 1915. The Regiment spent the summer on the lines of communications before it was attached to the 17th Infantry Brigade in September 1915. The 20th Punjabis subsequently took part in the capture of Kut-al-Amara on 28 September 1915. However, on the 23 October, two Afridis deserted and in doing so killed a Sikh soldier and the Regiment was once again withdrawn from the front line. The extract below was taken from the October 1914 Indian Army List and recorded the British officers serving with the 20th Punjabis. The 20th Punjabis moved to Amara in November 1915 and joined the 33rd Brigade. In April 1916, the Regiment’s trans-frontier Pathans were sent to East Africa where they served with the 40th Pathans. In July 1916, the Regiment left Amara and joined the 21st Brigade, 7th (Meerut) Division and saw action in the trenches at Sannaiyat and in the attack on 17 February 1917. For information regarding this period, it is best to turn to the regimental history and war diaries. In 1918, the 20th Punjabis moved to Egypt and the Regiment experienced trench warfare in Palestine and took part in the Battle of Megiddo on 19 September 1918. The 20th Punjabis remained in the Middle East until April 1920 and arrived back in India at Bombay on 3 May 1920. In 1922 the 20th Duke of Cambridge’s Own Infantry (Brownlow’s Punjabis) became the 2nd Battalion, 14th Punjab Regiment. There are four war diaries for the 20th Punjabis and the first three have been digitized by the National Archives. 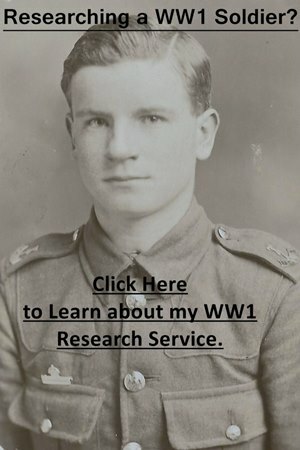 To download these war diaries for a small fee click on the first three blue links below which will take you to the National Archives’ website. The last war diary is only available to view at the National Archives. I have copies of all war diaries and have transcribed some entries below. Notes: A poor war diary between July 1914 and August 1915 with very few entries, though there are more detailed notes in the margin. September and October 1915 are a lot more detailed with longer entries, though this war diary is best read in conjunction with the regimental history. Notes: During this period Very little happened and the majority of entries consist of “Nothing of importance occurred”. British and Indian officers mentioned throughout. Notes: An average war diary though there are some longer entries. British officers appear throughout. Notes: An average war diary at best where many of the days have no entry. A good source of information for the Regiment and the British officers who served with it are its confidential reports held at the British Library: Confidential Reports on Regiments etc. These also contain the annual reports of British officers serving with the Regiment. However, when the 20th Punjabis was abroad only its Depot and the British officers serving with it were reported on. For information regarding the British and Indian officers who served with the 20th Punjabis, the Indian Army List should be consulted. I wrote an article for The Journal of the Orders and Medals Research Society about the life and death of a soldier serving with the Regiment which can be read here: Sepoy Wazir Chand, 20th Punjabis. There is also a regimental history which has been reprinted by the Naval and Military Press: Historical Records of the 20th (Duke of Cambridge’s Own) Infantry Brownlow’s Punjabis 1909-1922. A concise, yet very detailed regimental history with 6 maps which is full of useful information and very readable. Appendices include a Roll of Honour and a list of Honours and Awards. There is also a copy available to view online here. 31 July 1914 – Poona – Orders received to rearm the Short Lee Enfield rifle Mark III in place of MLE Mark II. 12 August 1914 – All Indian ranks on leave and furlough recalled and all reservists called out. 1 September 1914 – Received orders that the regiment would become part of IEF A and take 10% reinforcements above Field Service strength, kit Field Service winter less one blanket. 1 Dogra rejoined. 10 September 1916: No.1948 Sepoy Brahawan, D Company wounded while putting up barbed wire about 3 am. 11 September 1916: No.1894 Sepoy Ranjit Singh, D Company wounded whilst on sentry by day. 12 September 1916: No. 2104 Sepoy Hakil, D Company wounded whilst on sentry by night. 17 February 1917: The Regiment attacked and captured the 1st and 2nd Lines of a portion of the Turkish trenches at Sannaiyat at 2 pm. They remained there until about 4.30 pm, when a heavy counter-attack on the right, supported by an intense bombardment forced them to return to our own trenches, having captured 18 prisoners. At about 6 pm the Regiment returned to the Reserve Trenches. Casualties: Killed, Capt. C. H. M. Churchill, 2/Lieut. L. G. Burgess, IARO, Subadar-Major Masin Khan, Jemadar Jhanda Singh, and 67 Indian Other Ranks. Wounded: Subadar Kashmir Singh, Subadar Mahomed Khan, Jemadar Udham Singh, Jemadar Niaz Gul, Jemadar Natha Singh and 169 Indian Other Ranks. Missing, Subadar Said Gul and 18 Indian Other Ranks.